Today was one of those days when the cupboard was bare. Expected to put a nice dinner on the table this evening I was really struggling with the lack of groceries so had to get experimental. These culinary adventures do not always pay off but I am pleased to announce that today’s was a triumph. I found some beef in the freezer so decided that this was going to form the basis of a one-pot stew. Yes, it is summer and not traditionally a time for such hearty grub. I don’t know about you but it is feeling distinctly un-summery around these parts. Anyway, raiding the larder some more I found an eclectic mix of veg including; garlic, cabbage, potatoes, asparagus and white radishes…. Yes, Radishes in stew! I also found some Sharpham Park spelt and the home made passata I made a couple of weeks ago. 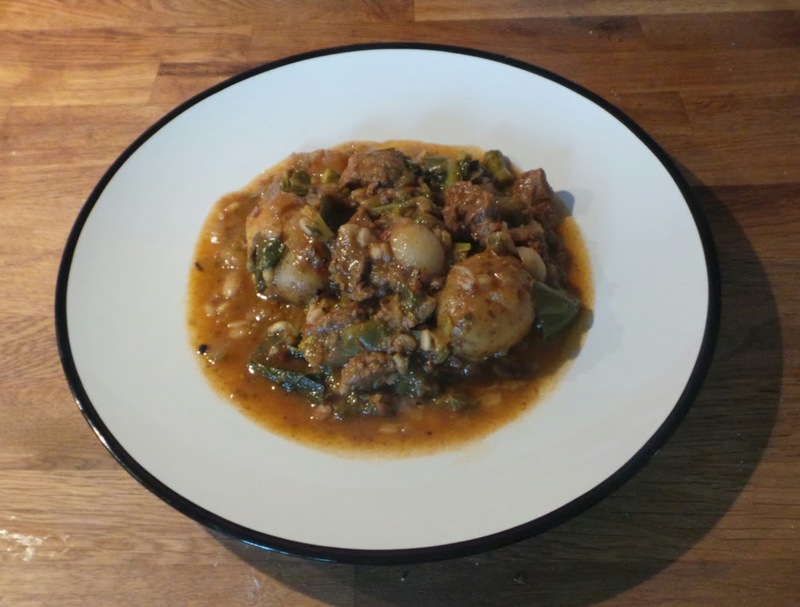 However the jewel in the crown of this stew was going to be bottle of Wychwood Brewery’s alcoholic ginger beer. 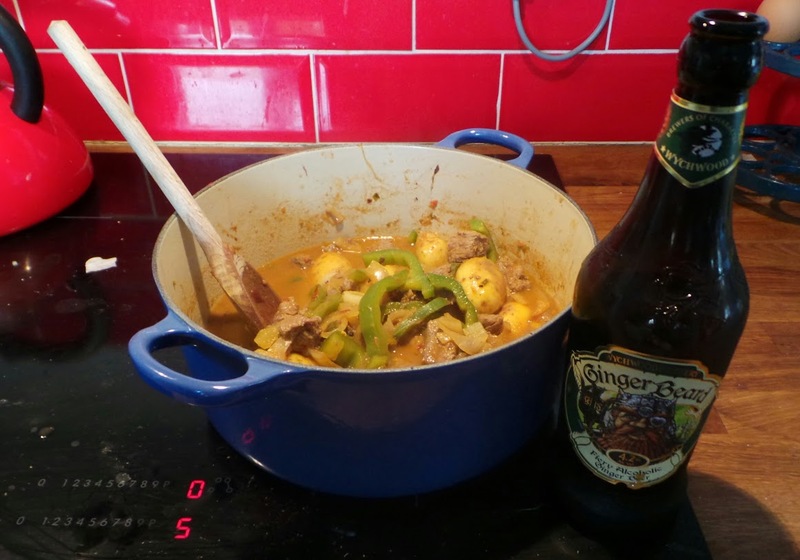 As you would imagine, buying only British, we have yet to find anywhere that we can buy fresh ginger so I thought that throwing a bottle of this brew in my stew would be an interesting little touch. Now, I am not going to tell you how to make a stew suffice to say that I threw all of my spoils into the pot and left for 3 hours to simmer on a low heat. The result was pretty good but the addition of the ginger beer really added a flavoursome gingery zing that we have not tasted in our food for 6 months. A triumphant ingredient in my book! I am thinking that a bottle of this stuff might be an interesting addition to a Thai curry or some other Asian style recipes. Give it a go and let us know how you get on! Sounds good to me – full marks for imagination! The ginger beer addition to stew is very interesting. On my list to try. However, don’t feel that stews in summer are out of order. We are in the Algarve in Portugal at the moment and most restauarants are offering stews in addition to grilled fish, chicken piri piri etc. Fish stews, goat (kid) stews, beef stews etc , but I had the most magnificent lamb (borrego) stew tonight with boiled spuds and veg. Excellent – it’s not surprising that this restaurant in Lagos is fully booked 2 days ahead! Sounds good! As a great fan of stews etc. I encourage you to invest in a pressure cooker which reduces the cooking time and energy costs by a least a 1/3 whilst retaining more vitamins and nutrients. Morphy Richards make a few and although they are not cheap they can save you a fortune over the years they should last.